The M4Eo subtype of acute myeloid leukemia (AML) has distinctive bone marrow morphology characterized by the presence of dysplastic eosinophils with abnormal granulation. 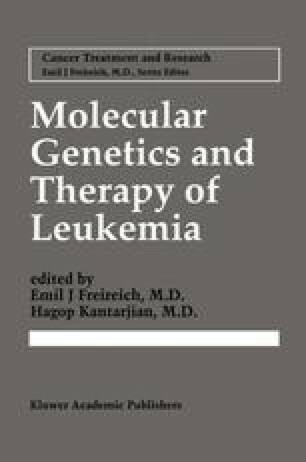 This distinct subtype of acute myelomonocytic leukemia (AMML or AML-M4) is predictive of a more favorable outcome with longer remission duration and survival following appropriate chemotherapy [1,2]. The original descriptions of this entity were reported in association with the chromosome 16 abnormalities inversion(16)(p13;q22), translocation (16;16)(p13;q22), and deletion (16)(q22) [1,3,4], referred to hereafter as inv(16), t(16;16), and del(16q), respectively. Thus a cytogenetic-clinicopathologic association was described between M4Eo and these chromosomal abnormalities. The association is not exclusive, however, with many examples of inv(16) now described in the setting of other AML subtypes such as M2 and M5 as well as myelodysplastic syndrome [5,6]. Some important recent work has been the cloning of the breakpoints associated with inv(16) and t(16;16) and the identification of the genes associated with those chromosome alterations. The steps of that process will be reviewed here, as will the development of molecular genetic tools and procedures which that work has made available to diagnostics. We will then consider the biological and clinical implications of a deletion that has been shown to have occurred in some inv(16) patients.